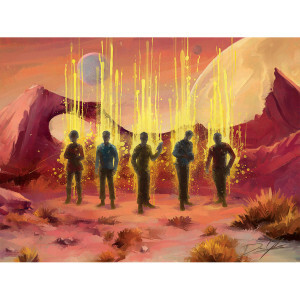 This print features features the iconic crew from Star Trek: The Original Series in the process of beaming while on an away mission. The scene is framed by the artist's unique style depicting the transporter beams transporting the crew. We see a grand view of the alien world while hinting at each character’s essence during the transport. You, the viewer, get to choose whether the crew is beaming up or beaming down. By artist Drew Johnson from Bye Bye Robot.